Today was swelteringly hot and overwhelmingly muggy. Obviously, then, the sensible thing to do was to go home and bake not one but TWO separate recipes, leaving the oven at 375 degrees for the better part of three hours. Luckily I am a very sensible young lady. At any rate, my friends are moving this weekend, and I’m out of town so I can’t help. Instead I’m contributing snacks! Probably better that way anyhow, I have little to no arm strength so I’m pretty useless with the boxes. I’ll stick with the first recipe for now, one I’ve tried before and already love. The other (blondies!) I’ve never tried, and they’re still in the oven, so I’ll report back later. Tasting the batter has given me pretty high expectations though! So, at hand we have raspberry-topped lemon muffins, by way of Smitten Kitchen, by way of Epicurious. These muffins are honestly more like little cakes, sweet and light, but because I don’t frost them I feel entitled to call them muffins anyhow. And eat them for breakfast. The pictures are a little iffy, because I forgot to borrow Sangyu’s camera and had to use my tiny one. But I think they get the point across. It’s very warm in my apartment now, and it’s making me sleepy, so I’ll stop here. Recipe below! Preheat oven to 375°F. Line 18 standard muffin cups with paper liners. Mash 1/8 cup sugar and lemon peel in small bowl until sugar is slightly moist. Whisk flour, baking powder, and salt in medium bowl to blend. Using electric mixer, beat remaining 1 cup sugar and butter in large bowl until smooth. Beat in egg. Beat in buttermilk, then vanilla and lemon sugar. Beat in flour mixture. 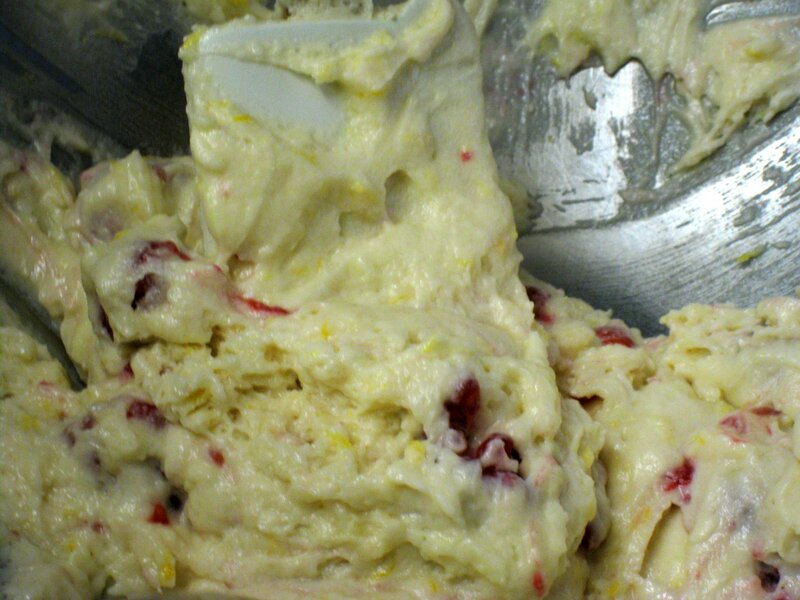 Set aside 18 raspberries, and gently fold the rest into the batter. Divide batter among muffin cups. 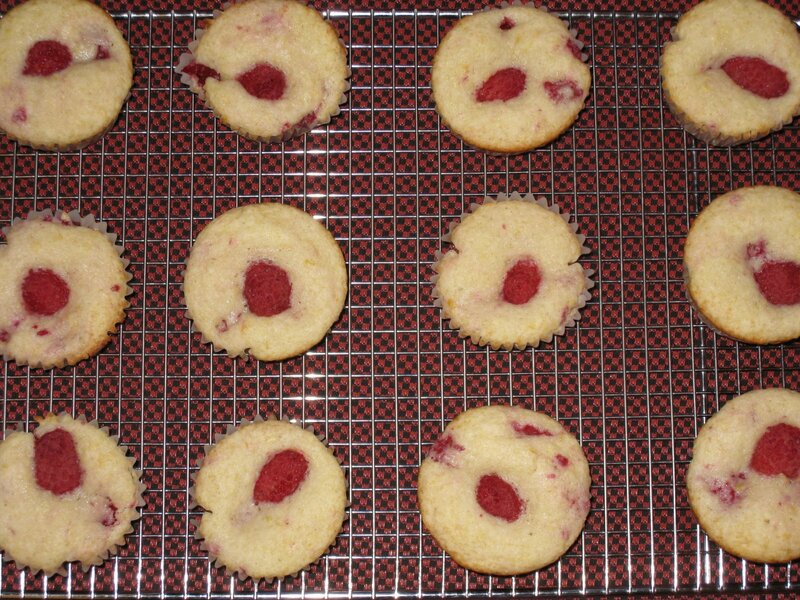 Top each muffin with a raspberry. Bake muffins until lightly browned on top and tester inserted into center comes out clean, around 20-25 minutes. 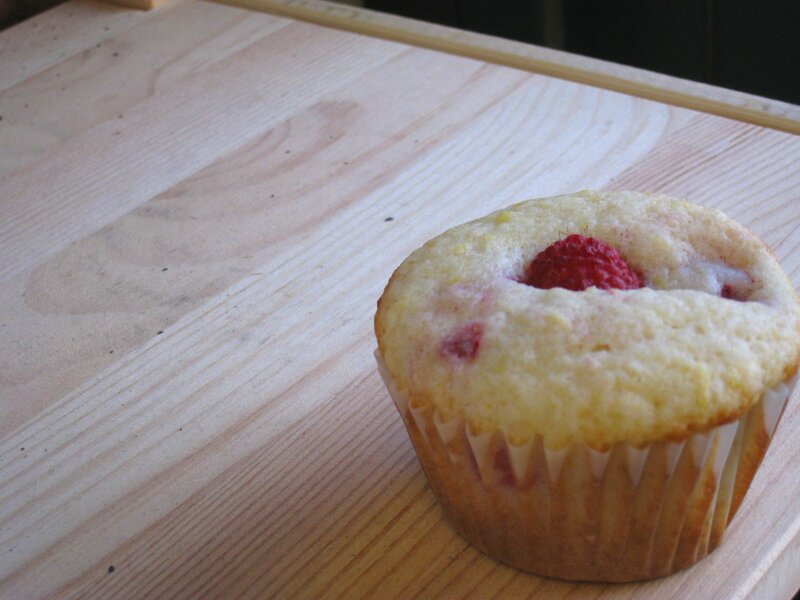 You are currently reading lemon-raspberry muffins at one cake two cake.